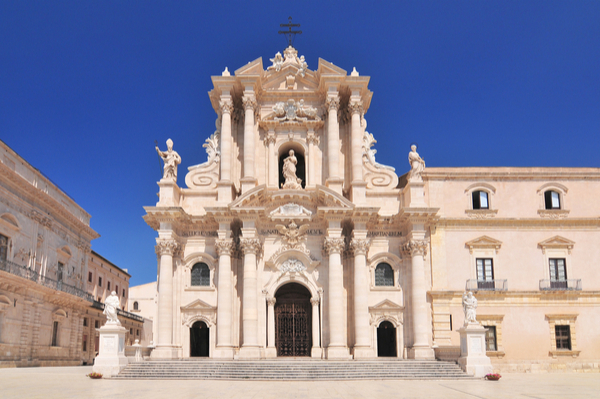 Siracusa, Sicily is the home of a stunning ancient Mediterranean city. The town of Siracusa was discovered by the Greeks back in 733 BC. Today, this historical island is home to more than 125,000 locals. The area is filled with rich history, turquoise Mediterranean waters, and some of the freshest seafood on the planet. 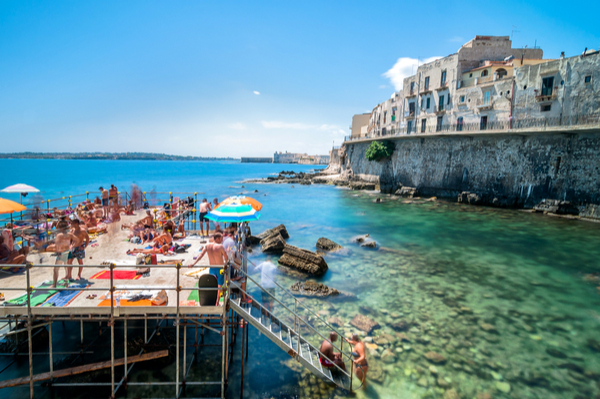 There is no doubt that Siracusa should be on your Bucket List with such an enriched culture and unique history dating back to ancient times. Siracusa is a city located on the southeastern corner of the Ionian Coast of Sicily. Today, thousands of tourists flock to the island which is located just south/southwest of Italy. This breathtaking city overlooks the coastal line of the Mediterranean Sea. The area is filled with natural beauty and gorgeous seafront Villas. Furthermore, the culture and history of this Italian city are truly one of a kind. Preserving the beauty and history of this remote destination has been excellently kept. Today, thousands of tourists come to visit this ancient city to enjoy the structures and history. Many travelers spend their time sightseeing these breathtaking historical attractions. However, many visitors are also interested to enjoy the nature and tranquility of the island. Aside from the fascinating tourist attractions, one can enjoy several outdoor activities including scuba diving, snorkeling, hiking, canoeing, bird watching, and sailing. As for food, the locally-caught fish are unlike any other fish in the world. The freshest of the fresh! 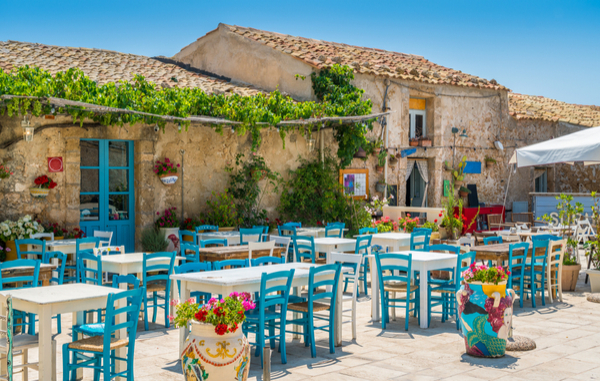 There are many wonderful restaurants in Siracusa such as Il Veliero in Ortigia and Il Giardino Degli Aranci. Certainly, these are two personal favorites where you can experience and taste the unique flavors of the local dishes. 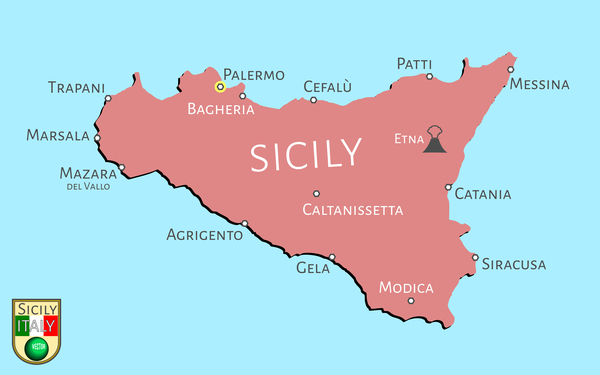 Fun Fact: Siracusa is known for it’s famous Noto almonds. The almonds in this part of Sicily are a sought out delicacy. We suggest that you try the almond cream or perhaps some Gelato with chopped almonds. This is a flavorful treat that you are sure to favor during your stay in Siracusa. Siracusa was founded in 733 or 734 BC by Greek settler Corinthians. Today, the city has become a window into the ancient history of the Mediterranean. A collection of historical landmarks filled with rare treasures of temples, ancient castles, and amphitheaters. Furthermore, exploring this city, you will feel as if you’ve entered a time warp dating back into early Christianity and medieval Judaism. 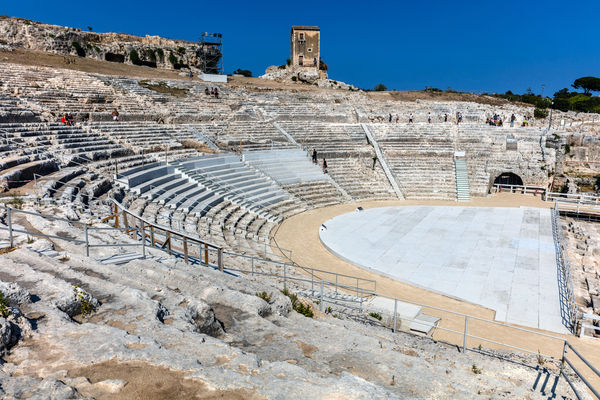 A main attraction of Siracusa is the Greek Theatre which dates back to the 5th Century BC! This Greek theatre can seat up to 15,000 people with 59 rows in total. Even today, this theatre is still used for festivals and concerts, usually in the summer months of the year. 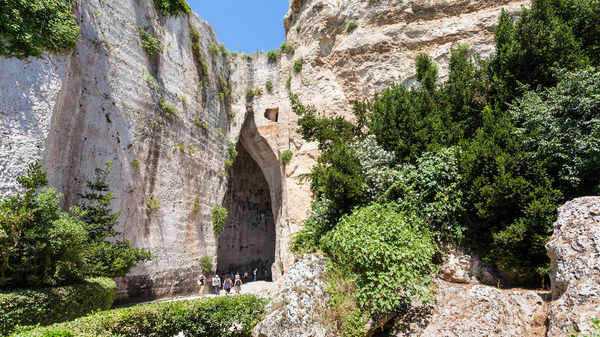 One of the more interesting sites to see in Siracusa is The Ear of Dionysius. The name of this structure was due to its unique resemblance of a human ear, named by famous the painter Michelangelo. Coincidentally, this cave is made of limestone and amplifies the sounds inside, which creates a unique and endless echo. History tells us that this cave served as a prison at one point in time. 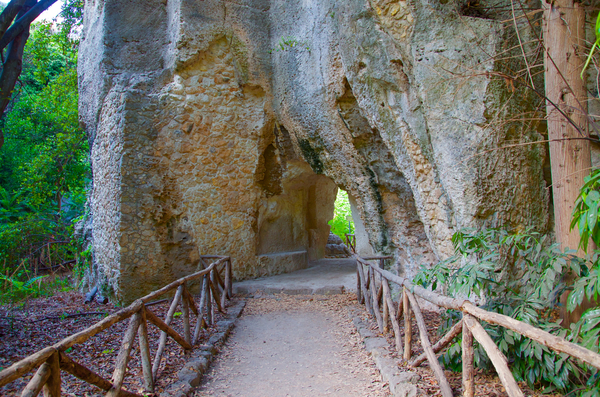 But today, The Ear of Dionysius is admired for its display of nature’s breathtaking beauty and ancient history. In 2005 Siracusa was named as a UNESCO World Heritage Site. With dozens of ancient places to explore, an unmissable site to visit is The Vendicari Nature Reserve. This Reserve is truly incredible as it overlooks the Mediterranean Sea and miles of clear blue water. There is so much history on this beautiful beach, the pictures just don’t do justice. We recommended that you explore the Ancient Hellenic Ruins, The Fountain of Arethusa’s, and the Temple of Apollo. Once you have the chance to visit, you’ll soon understand why these places are so famous. The churches and palaces are so amazing they actually call the city a “stone garden” because it is a lush Baroque masterpiece. Originally, we were looking for a special place to stay near the famous beach of Fontane Bianche, that we had heard so much about. And, lucky us, we found Hibiscus: one of the exclusive Sicily villas on the seafront. The villa’s garden was full of hibiscus flowers, great amenities, and a breathtaking location. Our villa had a barbecue, pizza oven and a terrace with views of the Ionian Sea. Also, there was a solarium where we were able to gaze at the stars every night. In short, Siracusa is the perfect choice for a holiday for those who want to relax and enjoy the sun and sea. A true historical destination filled with character, culture, and dozens of activities for the entire family. 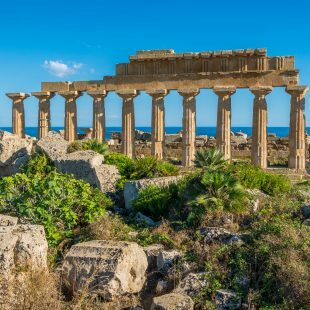 If you are considering a special holiday in Europe full of beautiful landscapes and rich culture, Sicily is the place for you! Specifically, the area around Siracusa is a must if you plan to enjoy Sicily’s beaches and history. 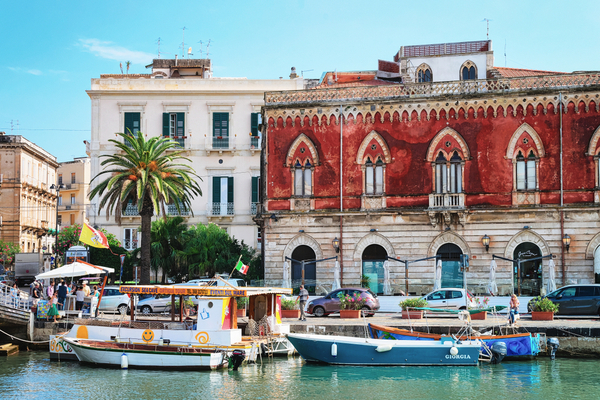 Siracusa, Sicily is truly a stunning Ancient Mediterranean City waiting to be explored.